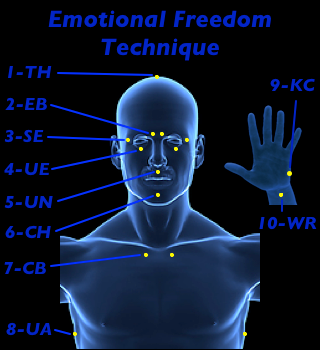 The Emotional Freedom Technique combines Ancient Chinese Acupressure with Modern Psychology. This version is specifically designed to help you quit smoking. The meridian tapping and the verbal statements help focus the mind to help you quit smoking. The verbal statements are used first to bring the negative situation or emotion into focus and then to identify the problem. Next, empowering statements are made followed by positive affirmations, accompanied with tapping certain meridian points, and deep breathing. By tapping during these statements you are stimulating energy pathways and restoring the body’s energy balance, which allows healing. The deep breathing allows you to relax. THIS TECHNIQUE WORKS GREAT. You want to do this technique in the PREP phase, and also in the QUIT phase until the urge to smoke disappears. This technique can be easily modified by changing the statements, to help relieve emotional pain, trauma, compulsions and addictions. Use this technique anytime to help you reduce stress and/or anxiety. Many therapist use this technique. 1-TH- Top of Head : Located down the center of the skull, tap with both hands with fingers back to back. 2-EB – Eyebrow : Located at the inner edge of the eyebrows, closest to the bridge of the nose. 3-SE – Side of the Eye : Located between the eye and the temple on the bone. 4-UE – Under the Eye : Located on the cheekbone about 1-inch under the eye directly under the pupil. 5-UN – Under the Nose : Located between the bottom of the nose and the upper lip. 6-CN – Chin : Located at the center point between the bottom of the lip and the chin. 7-CB – Collar Bone : Located right below the hard ridge of collar bone, where the sternum and first rib meet. 8-UA – Under the Arm : Located on the side of the body about 4 inches below armpit. 9-KC – Karate Chop Point : Located on the edge of the hand, about 1-inch above the wrist. 10-WR – Wrists : Located on the inside of the wrists, just beneath the hands. Tap both wrists together. SAY: Smoking cigarettes is bad for me. I am addicted to nicotine. SAY: Smoking cigarettes is an unhealthy way to relax. Smoking cigarettes is an unhealthy way to relieve stress. Smoking cigarettes is unhealthy. While Tapping Specific Point Say Empowering Statement. Then do breathing exercise 4-7-8 (1 cycle) then go to the next statement and next point. Self Empowering Statement 1 – Even though I want a cigarette, I choose not to smoke. Self Empowering Statement 2 – Even though I’m a smoker, I know it is bad for me, and I choose to quit for my health. Self Empowering Statement 3 – Even though I’m a smoker, I choose to quit, so I can live a healthier lifestyle. Self Empowering Statement 4 – Even though I’m a smoker, I choose to quit, so I can live longer with my family. Say Positive Affirmations while tapping specific point, then do the deep breathing (4-7-8) technique. Tap rapidly, about 3 times per second using your 4 fingers. Tap with your finger tips, NOT your fingernails. Tap forcefully but not to forcefully where you may hurt or bruise yourself. Use both hands on Points 1, 2, 3, 4, 7, 8. The statements should be spoken in a loud enthusiastic voice. If you can stand in front of a mirror, please do so. Positive Affirmation Statement 5 – I choose to no longer want a cigarette. Positive Affirmation Statement 6 – The Deep Breathing Exercise is very relaxing. Positive Affirmation Statement 7 – The Emotional Freedom Technique is freeing me from my nicotine addiction. Positive Affirmation Statement 8 – I choose to no longer be addicted to nicotine. Positive Affirmation Statement 9 – I choose to no longer be addicted to cigarettes. Positive Affirmation Statement 10 – I no longer want a cigarette, I am calm. Please try the technique and Post results below.